(MENAFN - The Conversation) The Indonesian presidential election on Wednesday will be a re-run of the 2014 poll, pitting the incumbent, Joko Widodo (also known as Jokowi), against the same candidate, former major-general Prabowo Subianto. Various polls over the past few months have consistently shown Jokowi with a sizeable lead. The last survey from the Centre for Strategic and International Studies (CSIS) , for example, shows Jokowi with a lead of 51.4% among likely voters, compared to just 33.3% for Prabowo. (The rest are undecided.) The latest poll this week from Indo Barometer , meanwhile, gives Jokowi an even wider lead – 59.9% to 40.1%. With a total of nearly 200 million registered voters expected to cast ballots at some 800,000 polling stations across the country, the election is a massive undertaking . Making things even more complex this year is the fact that legislative elections are being held at the same time as the presidential election, with some 250,000 candidates running for more than 20,000 legislative seats. However, the legislative elections have not received the same level of domestic or international attention as the contest between Jokowi and his old adversary, Prabowo. Jokowi has spent the past few months highlighting his achievements since entering office in 2014, especially with infrastructure development and the streamlining of bureaucracy for businesses and the general public. Prabowo, on the other hand, has tried to chip away at Jokowi's lead with a fiery brand of nationalism and promises of change (for example, the halting the importation of food and fuel , lowering prices for staples and reducing inequality ) without offering any details on how to achieve them. Prabowo's leadership abilities are also unclear – he's never held elected office. Even though Jokowi has a big lead in the polls, he has nonetheless faced questions about his religious credentials and specifically whether he is 'Muslim enough' for the hard-line conservatives in his party. Just days before the election, he embarked on a quick trip to Mecca in Saudi Arabia – a move many analysts believe was intended to shore up support among religious voters. Jokowi has also selected one of the most influential Muslim clerics in the country, Ma'ruf Amin , to be his running mate. Ma'ruf is head of the Indonesian Ulema Council (Majelis Ulama Indonesia), a top clerical body comprised of registered Muslim organisations across the country. Jokowi's decision to choose Ma'ruf as his running mate has not been popular with his more moderate supporters. His initial preference for running mate was Mahfud MD, a former chief justice of the Constitutional Court of Indonesia and a former minister when Abdurrahman Wahid was president. However, this move carried the risk of being perceived as not 'Muslim enough' for religious voters, hence the selection of Ma'ruf. So far, this decision has seemed successful. The results of surveys indicate that although Ma'ruf's overall popularity is not as high as Prabowo's running mate – the former vice governor of Jakarta, Sandiaga 'Sandi' Uno – most prospective voters are only looking at the top of the ticket. The contest is squarely between Jokowi and Prabowo. 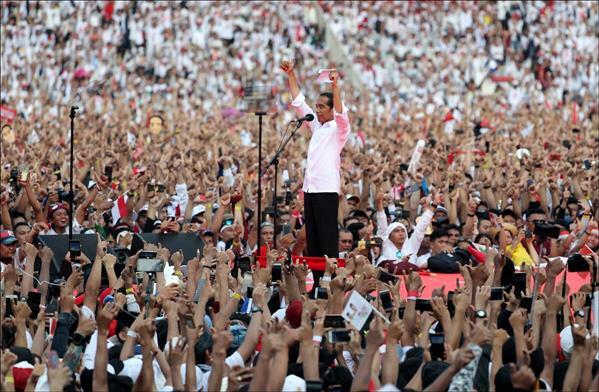 However, there are also concerns that Jokowi's more moderate supporters think he has not yet fulfilled some of his promises on human rights , and they may abstain from the election in protest. There is a campaign on social media urging people to abstain or cast blank ballots – known as golput in Bahasa. Should Jokowi win as expected, he is unlikely to bring sweeping changes to the country. The main challenge for him will be continuing Indonesia's economic growth . Further reforms are needed to reduce protectionism, encourage foreign investment and improve productivity. With the mining industry in decline, more attention should be focused on sectors with growth potential, such as agriculture, manufacturing and services, including tourism and hospitality. The government needs to do more to tackle corruption and cut red tape, too. As for foreign policy, Jokowi's focus will likely remain on economic diplomacy and market expansion. One priority will be implementing the just-signed free-trade agreement between Indonesia and Australia , which will eliminate many tariffs between the countries and increase the number of work visas for Indonesians in Australia. The deal is also expected to allow Australian hospitals to open and universities to set up campuses in Indonesia.